I take a brick wall and set it horizontally in front of me as a makeshift table. I freeze it in place so it floats in mid-air and set a couple ping pong balls and a paddle on top. I set the Modbox scene into play mode and the balls start bouncing on my brick table. I pull up my paddle and start precision tapping the ball in mid-air, juggling several times before it bounces away toward the ground. This is less than five minutes into my hands-on with Modbox in the HTC Vive. With zero training or explanation about how to play I just dive right in and figure out these basics of mini-game creation using the available tools. The selection system is exactly like Tilt Brush, but instead of a 3D painting experience, I’ve got a physics engine and interactive toys with which to create my own little game. “As soon as objects collide with each other in edit mode they automatically meld into one single body. Because of that I knew you could create really complex contraptions,” Modbox developer Lee Vermeulen told UploadVR. There isn’t enough time to really master the toolset in the roughly 10 minutes I play but it’s enough to see that it’s intuitive. There are also some pre-made games to explore too, like basketball and ping pong. This part of the game is reminiscent of the Toybox tech demo from Oculus — a variety of fun things to do. I can’t tell if it’s my tendency to not fully extend my arms when throwing a ball in VR or whether gravity is turned up way too high, but my attempts to toss a ball in the hoop are pretty embarrassing. Vives are set up at the Vision Summit in Hollywood one after another in adjoining rooms with relatively thin black sheets separating them. There’s also overhead lighting beaming down on the setups. 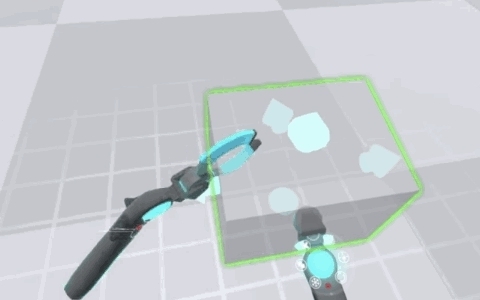 It’s unclear the cause, but there are tracking problems for many of the Vive demos, including Modbox. Like virtually all VR demos these days, I’m anxious to get my own equipment set up in a place where I control the variables so I can explore a creative experience like Modbox at my own pace. Vermeulen tried the Vive in September and he and his partner, who is based in Australia, got the headset in October. After a development crunch through November, the trailer for the game debuted in December. They hope to put it out as an open beta as soon as the Vive is available to consumers. While Modbox occupies the same VR creativity genre as Fantastic Contraption or Tilt Brush, the experiences are heading in very different directions. “It’s about … creating complex environments and a whole house, or a target practice thing or you can use walls so you can have entire levels,” he said. Vermeulen found the work of Australia-based Harley Price in the Unity Asset Store and the two collaborate entirely online for the project. Though they are building this game together, they’ve only ever met in VR while working on a multiplayer version of Modbox. Find out more about Modbox on Steam early access.